Finally, Kubo explains Orihime’s power. Not far from what I had guessed. Picking up from where last chapter left off, Ichigo, Ishida and Sado begins their journey to Hueco Mundo. Tatsuki, Keigo and Mizuiro come out of their hiding spot, and Urarhara comments on Ichigo’s naivete in dealing with his friends. Jumping to Hueco Mundo, Orihime comes face to face with Aizen. It’s made clear that Lupee’s and Yami’s attack was simply a diversion so that Orihime could be abducted, which made Lupee unhappy. Aizen asks her to heal Grimmjaw’s arm, which had been vapourised by Tousen. Lupee claims that such a thing is impossible – afterall, no one can remake something that has been completely destroyed. But Grimmjaw’s arm came back. After the explaination, Grimmjaw gets Orihime to heal the damage over his ‘6’. As soon as that is done, he kills Lupee and reclaims his spot as no.6 of the Espada. Not even Chuck Norris could dodge the sudden gas explosion from Optimus Prime’s rear-end. Let’s just talk about Orihime’s power. Can anyone say “OMG overpowered nerf!!!”? Here it is, ladies and gentlemen: a real life Ctrl + Z (Apple users need not apply). Fell and twisted your ankle? Knocked up some random girl? Finally ‘accidentally’ ran over that annoying little old lady who lives next door? Call Orihime Reality Rejection! We’ll fix everything from broken kettles to broken relationships! If we take Aizen’s explaination literally, the potential is limitless. Every instance we’ve seen this power used was in the capacity as a healing tool, but ptentially anything is possible, maybe even bringing dead people back to life, or turning taking away the power that someone has gained. It also seems that Orihime can micro-target the effect of her power, to affect anything that she wishes it to affect within her field, but ONLY that thing. If you recall when she first used this power, she healed the seeds implanted into Tatsuki and the other students without affecting their memories – at least one seed was clearly stuck in Tatsuki’s head. She rejected the existence of the seed, but not anything else that was in her field at the time. There are all sort of questions that one would like answered about her power – can her power affect memories and thoughts? Is her power limited to all things physical/spiritual? Or maybe it only applies to living things? What is the time limit on her power – i.e. how long after an event has occured does her power become unusable? Or is there a time limit at all? The answer to the last question is especially important. If there is no time limit on her ability, what stops her from rejecting the existence of a person or an event all together? Imagine if she rejected the Holocaust or the even that caused the extinction of dinosaurs! At the very least we’ve seen that her power has a limit in how far it can reach. She can make a very big field, but the power is limited to the things within that field, so unless her power can encompass the entire Earth, the Holocaust or dinosaur’s extinction cannot be unmade. Also, her power can be stopped. If Tsubaki (her attack familiar) could be hurt, there’s nothing stopping her two regeneration familiars from being taken out of action as well. Now this also brings up interesting questions about Tsubaki and her shield. If the nature of those are rejection of reality as well, that means that nothing cannot be cut once Tsubaki gets close enough, and nothing cannot be stopped with her shield, because she’s rejecting the exsistence of her enemy or the attack that she’s defending against. It’s no surprise that Kubo gave the power to Orihime. In the hand of anyone else this power would be absolutely unstoppable. Finally, what does Aizen want her power for? The possibilities might be limitless, but she’s useless if Aizen has no specific objective in mind. From what we know about Aizen, that’s simply not possible. We know Aizen’s aim is to remake the Key and basically become God. No one knows where the key is, but the key can be made by sacrificing a large number of souls in a special area that is saturated with spiritual energy. Once the key has been made, the door to the heavens can be opened. Is Orihime’s power neccessary in making the key? Maybe Aizen simply wants her near himself, so that he can use her power but the Shinigami can’t. Other interesting points: Grimmjaw says his power has returned, which means that he wasn’t fighting at full power when he didn’t have his arm. More and more I think Grimmjaw is ridiculously powerful – if you consider that Bakuya was probably the third or fourth strongest captain, even without his release and his arm Grimmjaw’s stronger than all but two or three people in Soul Society. Now that he’s got his arm back, how insanely strong would he be when he releases? And that’s just Grimmjaw, who’s no.6. 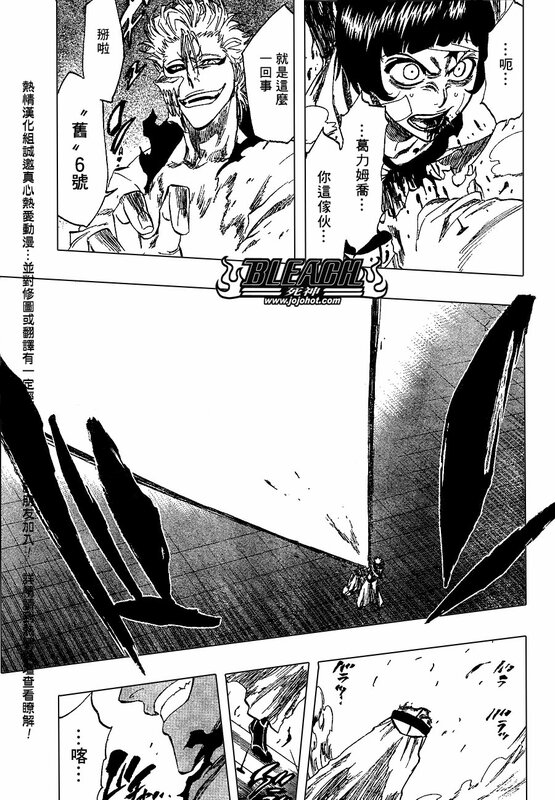 Ulqiorra is most definitely ranked higher, and then on top of the first 5 Espada there are Ichimaru, Tousen and Aizen. The odds are really strongly stacked against the good guys here. The only good news is that if you look at how well Urahara fared against Yami who’s the no.10 Espada, there’s a high possibility that the real world faction would stand a chance against the top 8. I’m including the Vaizard in the real world faction – I’m 80% confident that Shinji is allied with or at least knows Urahara. I loved this article, and yes with Urahara and the Vaizard they can definitely take on the top 8th. Urahara is also ridiculously powerful, he was toying around with the arrancar he fought, wouldn’t suprise me if his power equals that of Aizen. Complete and Concise explanation of Orihime’s powers. If she finally becomes self-aware of what she is capable of, I think she will definitely change things. The outcomes will forever change Hueco Mondo and Las Tacos Bell forever. Hopefully in favour for the good guys. I am interested to see how Orihime is recaptured by her friends– and how she reacts to Ichigo’s rescue. Being an IchiHime fan, I really liked this development. I think Aizen would use Orihime for an Instrumentality attempt, basically making the key, opening Heaven’s Door and force Orihime to reject material existence so that every soul would enter Heaven and become Gods. I know this is unlikely because Bleach is a shonen manga, (most Instrumentality stories occur in psychological anime, for example Evangelion and Code Geass) but hey, it might be a possibility. Or maybe, Orihime IS the key!